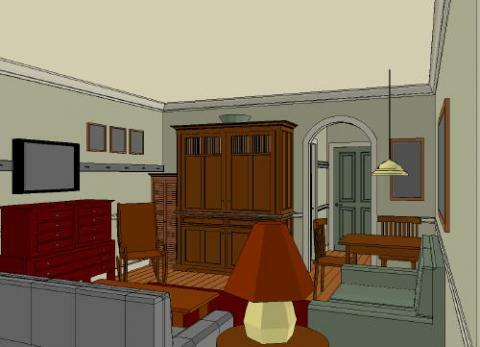 How can one room become an entire house, and still have all the comforts of modern life? That’s what I (David Beer, President of YesterTec) was trying to envision as my daughter was describing her new East Village home in one of New York City’s infamous studio apartments to me. She was so excited! “It has two windows Dad!” It was about 12 ft. x 14 ft. plus a small exposed kitchen, a two foot wide closet (that was half-filled with the hot water heater, so in effect, no closet) and a tiny bathroom with a tub/shower. It had no air conditioning, sloping floors and an inefficient thru-the-wall heater, and all for the ‘cheap’ price of $1400/month for approx 254 sq. ft.! 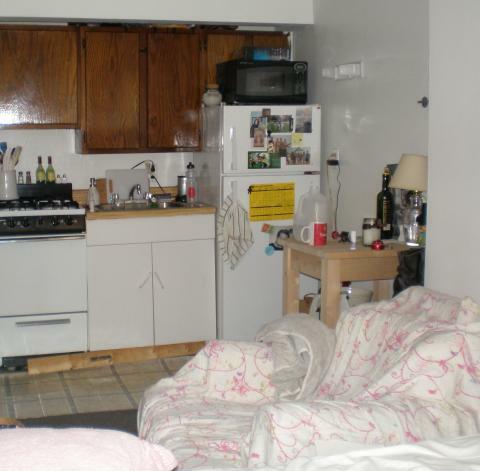 But even with no storage, a messy kitchen and a queen size bed eating up the floor space, it was livable. But it got me thinking. How could these very typical studio apartments be improved? And aren’t studio apartments very similar to small extended stay hotel rooms? 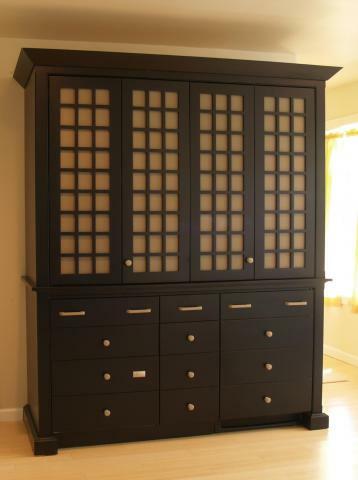 By eliminating the messy kitchen in favor of one of our Armoire Mini-Kitchens, the room could look so much better. 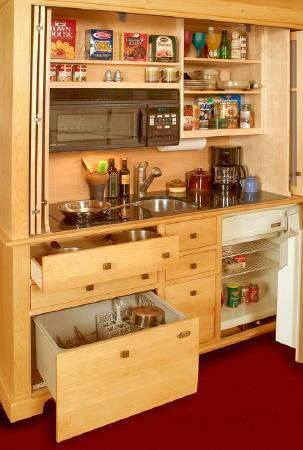 Being able to close the doors that hide the countertop, cooktop, sink and upper storage areas is a HUGE improvement. This 260 sq. ft., 12 ft. wide studio has another change that really helps. A Bigger Closet! Armoire Mini-kitchens hide a messy kitchen behind pocket doors that feature YesterTec’s exclusive U.L. listed Technology that allows the oven and cooktop to operate only when you can see them. Small Studio Apartments and Extended Stay Hotel or Condo Hotel rooms have very similar problems. Though they don’t need as much long term storage, they still need all the modern comforts in a limited space. Here, by increasing the size to 268 sq. 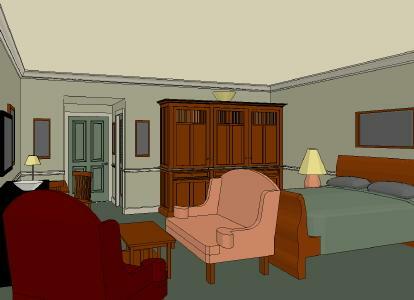 ft., the 12 foot wide room becomes a multi-functional living room by day and a spacious bedroom by night. The messy kitchen is hidden away, eliminating the ‘RV’ look (small living room exposed to a tiny kitchen). 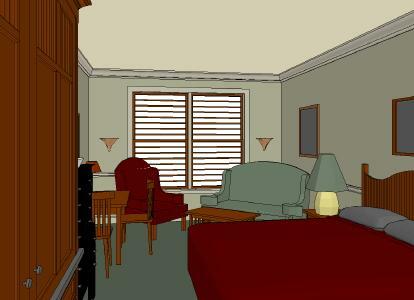 The ‘Living Room’ appearance is possible because the queen sized bed is hidden in the love seat. This arrangement frees up the floor space for a real living room look, and saves the space that’s normally required to store the extra seating. And look what happens with just a little more space! This 324 sq. ft., 14 ft. wide room includes a 7ft. long sofa. The sofa is great for daytime naps and the love seat/sofa bed and rocking chair completes a normally sized seating area. Here’s a 330 sq. 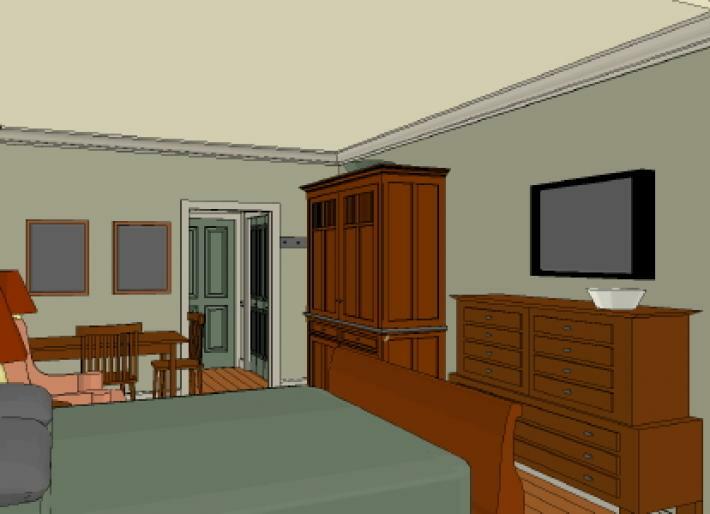 ft., 12 ft. wide Hotel Room with a king sized bed that has been converted into an Extended Stay room simply by adding the Kitchen Armoire. Since it only takes up 12 sq. 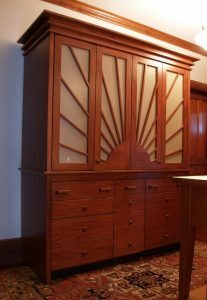 ft. of floor space, the Kitchen Armoire can fit into most units, especially ones where the entertainment armoire has been replaced by a wall mounted flat screen TV. This 394 sq. ft., 17 ft. wide Studio Apartment features a Master Kitchen Armoire that includes a full sized refrigerator/freezer with ice maker and more storage than our 6 ft. wide Kitchen Armoire. 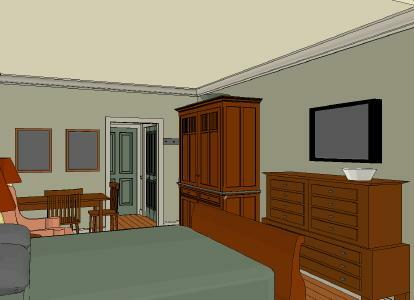 The 8 ft. wide Master Kitchen is sized for studio through 2 bedroom extended stay applications. The refrigerator module can be separated from the Kitchen Armoire to accommodate many other arrangements as well. The idea here is to offer the guest appealing choices. For example, room service can simply bring ingredients for the guest to cook a meal. Or a chef can be sent to the room to prepare a meal. Or a pre-prepared meal from room service can be held and then warmed up at a later time. Left-overs from area restaurants can be stored for a later time. And of course, the guest can bring ingredients to be cooked just the way he wants, anytime he wants. Offering all of these choices shows that the hotel really cares for its guests. And all of these choices can happen without compromising the room’s design theme with an exposed kitchen. The examples shown above are intended to show how saving space can be accomplished in these multi-task rooms. What is implied is that saving space is the most GREEN building technique there is, since less space means fewer building materials and energy resources are required. In addition, the Kitchen Armoire can be moved, just like furniture, if the need arises, thus increasing its lifespan, which is also a GREEN feature. There are of course countless other studio and hotel guest room floor plans that can benefit from a completely enclosed kitchen. Many sizes and styling options are available for these custom pieces. 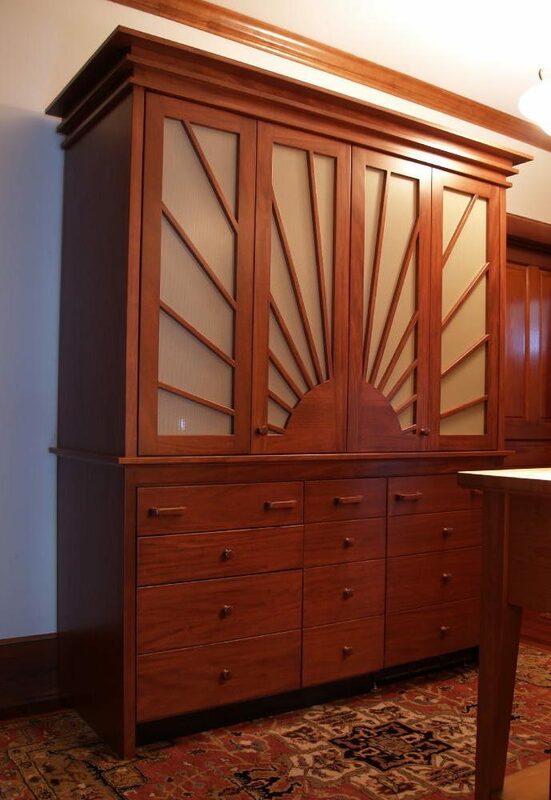 The Kitchen Armoire can even be built into recessed wall spaces, for a more minimalist design. So we hope that you will think about some of these ideas for your next small multi-functional living space project. Please call us to discuss your ideas as we would be happy to help you create your very special design. 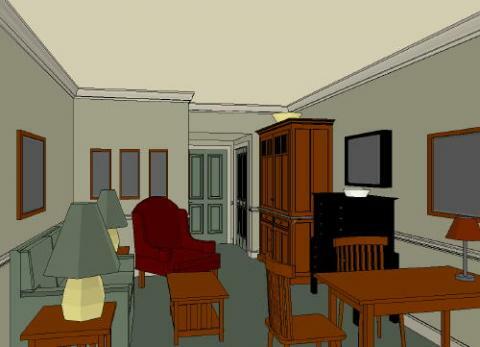 The article above uses images that were modeled with our 3-D CAD design program. All of our workstations have many available styling options, but only a few of these options can be modeled in the images. To create each workstation, our designer’s catalog that graphically shows all the available options is required.